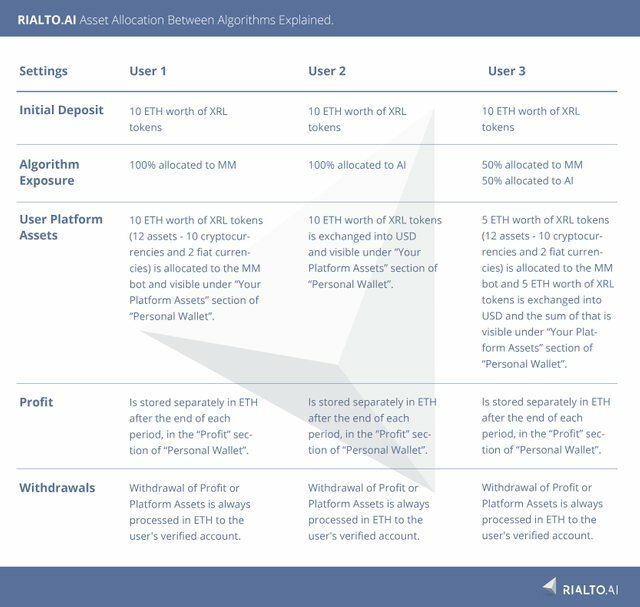 The purpose of this article is to clarify how the allocation of assets works within our RIALTO.AI platform depending on the choice of trading algorithms for each user. Users can currently choose between “Arbitrage and MM” and “AI Bot” algorithms. The difference between the two is that the Arbitrage and Market Making (MM) algorithm is trading between 12 different assets (10 cryptocurrencies & 2 fiat currencies) while the AI Bot algorithm trades only USD/BTC and USD/ETH pairs and therefore utilizes USD as its base currency in which the assets are held at the beginning and the end of the trading period. For easier understanding of how assets are managed under different algorithms, we are providing three examples of exposure settings that our users most often select on our platform. The maximum utilization rate of the AI Bot algorithm however depends on the number and capacity of its back-tested strategies and increases over time as new strategies are added. In its first period, the maximum utilization for the AI Bot was approximately $639,212, which has now increased to $856,267 for the current period. This is an important factor which significantly affects each user's asset allocation exposure. For example, if all active users together allocated $1,000,000 worth of XRL tokens to the AI Bot algorithm, which only had a utilization capacity of $600,000, allocation of assets to the AI Bot algorithm would be proportionally reduced for all users. In other words, only 60% of each user's allocated funds would actually be traded. In the current period (20.8. – 3.9.) the utilization capacity of the AI Bot is $856,267 for $1,172,968.84 of allocated assets or approximately 73%. Hopefully this clarifies the issue of asset allocation and profit calculation on our Rialto.ai platform. If you have any further questions or would like to stay up to date with our project, be sure to subscribe to our newsletter and follow us via our social media channels linked below.